The ultimate guide for travel with children from birth to 5 years. I first tried these out with my kids when I grew weary from scrubbing “washable” kid’s paints off my kitchen table, floor, walls, and vacuum cleaner. I know that half the fun of painting for little kids is the skloosh of it squirting between the fingers or the gratifying plop as it schlops off of the chandelier onto a younger sibling, but in the airplane and at Grandma’s house messy paint just doesn’t fly. 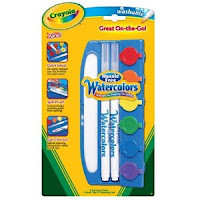 For my preschooler, I was instantly sold on these “Hassle-Free Watercolors” from Crayola. They are actually safe to use on the airplane tray table, in the car, at the vacation rental with the hefty security fee–and even at Grandma’s house. Whenever it’s time for a little travel art, just wet the white “cleaning pad” at the front of the paint set (you can just drizzle it with water from your cup) and moisten the ends of the painting pens. Your child dips them into the different colors as desired and creates an airline napkin masterpiece. When finished, just snap the color lids closed and cap the paint pens, and into the carry-on it goes. If your child paints for a quite a while, or with much fervor, you will need to remoisten the pad and paint pens with more water. For us one set lasted through several uses, and it was perfect having two pens to keep two kids busy at a time. nice toy for kids but not easy ti find in my city, nice read. 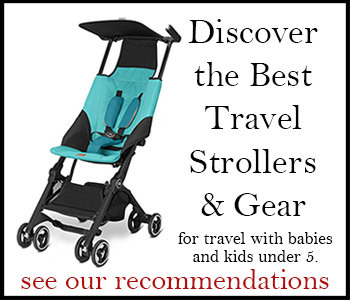 TravelswithBaby.com - Copyright ©2004 - 2019 Shelly Rivoli, all rights reserved.